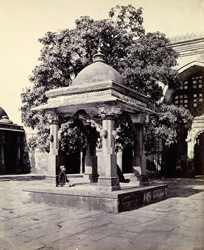 Photograph of a pavilion in the courtyard of the Jami Masjid at Cambay in Gujarat, taken by Henry Cousens in the 1880s, from the Archaeological Survey of India. This small structure comprises a canopy supported on four pillars. It stands in front of the entrance to the mosque at Khambhat, or Cambay, an ancient sea-port, about 84 km (52 miles) south of Ahmadabad. The city was captured by 'Ala u'd-din Khalji in 1304 and the mosque was built shortly after in 1325. On the south side of the mosque is a square tomb, built of marble, where 'Umar b.Ahmad Gazruni (d.1333) is buried. The mosque sanctuary has an open courtyard in front, surrounded by corridors. The main sanctuary has one hundred pillars supporting the roof that were evidently taken from Hindu and Jain temples. The front aisle of the sanctuary has a flat roof with mouldings along the edge framing the arched entrances. The jambs of the central part of the facade are nearly forty feet high, and crowned with pointed finials. This tall central section together with the raised side sections conceal the domes of the roof from view.